Note: Please do not schedule your onward flight until after 4:00 p.m.
Relive the romance of a bygone era traveling on the world’s most luxurious and historic train, the Rovos Rail. Before experiencing the timeless grace and high romance of African exploration via this legendary train, you’ll spend three nights in Cape Town. Cradled by the imposing Table Mountain, Devil’s Peak and Lion’s Head, Cape Town is known for its majestic beauty, offering a blend of cosmopolitan city life and outdoor adventure. From here, fly to Kasane, Botswana for your four-night Zambezi Queen wildlife and safari cruise. Revel in the Chobe National Park’s breathtaking scenery and marvel at its mighty elephants splashing in the water and the stealthy lions ruling over the plains. Continue to the UNESCO-designated Victoria Falls for two nights prior to spending your last three nights traveling 1,000 miles through Zimbabwe and on to South Africa. 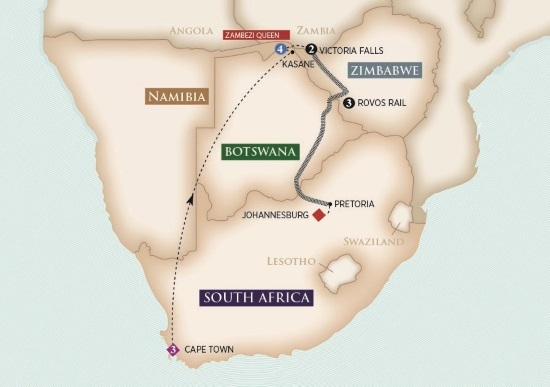 Experience five-star cuisine, excellent South African wines, extraordinary scenery, amazing wildlife and a safari at Hwange Game Reserve as you journey through southern Africa. RWANDA EXTENSION - Rwanda offers unimaginable beauty with the utterly spellbinding Volcanoes National Park—home to the rare Mountain Gorillas and Golden Monkeys. Extend any of our five itineraries with four amazing nights, discovering Rwanda’s natural wonders and wildlife on an epic adventure. After arriving at Kigali Airport, you will be met by an AmaWaterways Representative and transferred to Kigali Serena Hotel for the evening. Single Supplement: 50% of per person pricing listed above. Homebound international flights return from Kigali. Intra-Africa Air: $975 per person including taxes and fuel surcharges. Single Supplement: 40% of twin price for Cat. SB & SA; 100% of twin price for Cat. MS. Please see terms below for details.